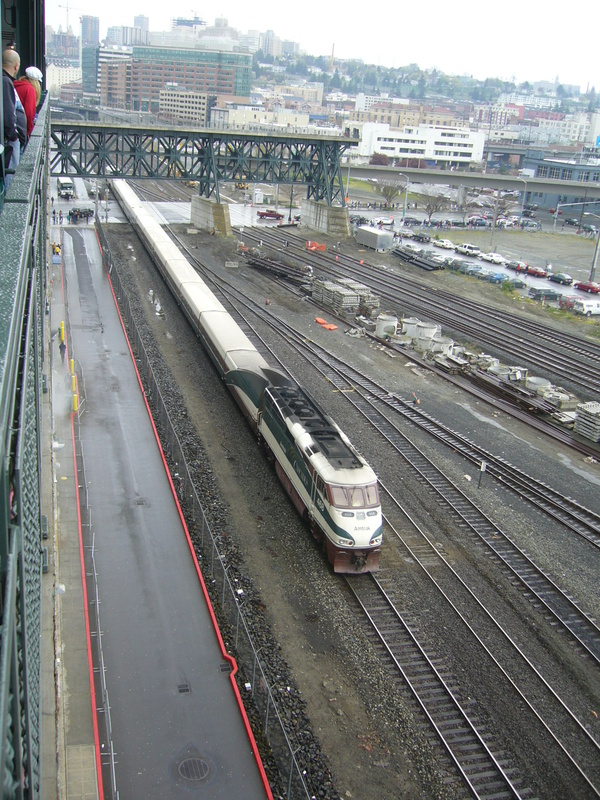 On Saturday March 13th, the National Association of Railroad Passengers (NARP) together with All Aboard Washington (AAW) and the Association of Oregon and Rail and Transit Advocates (AORTA) held their annual meeting in Seattle. I attended the meeting and was pleased to see about 100 people enthusiastic to hear about the latest news about the Cascades rail service in particular but also about other Amtrak services in the Pacific Northwest. Unfortunately for me the train I was planning to take to Seattle was canceled and I had to take a bus in both directions. Although it got me there on time, it wasn’t nearly as comfortable. Loren Herrigstad, President of All Aboard Washington spoke about the need to develop a “Rail Lifestyle”. In his examples on his primary themes was to make it easier for bicyclists to travel by train. Currently the Amtrak Cascades trains can only take a few bicycles and have to be loaded by a baggage handler. Loren also used the Swiss example of excellent rail/bus integration, his own ‘pet’ topic of allowing dogs on the train, as well as having train coaches segregated by type of rider instead of destination like they do now. He thought there should be a bike car, family car, dog car, quiet car for example. He also mentioned the importance of train stations becoming community hubs and activity centres. Jonathan Hutchison, Government Affairs – West, Amtrak spoke about some of the things happening with Amtrak these days. The future is brighter for Amtrak with increased operating and capital funds, but he cautioned those hoping those advocates of re-instated trains such as the Pioneer and the North Coast Hiawatha not to assume that those trains will be seen anytime soon. The $600 million in stimulus money has been awarded but he doesn’t know which projects will be selected by the FRA as they are the ones that make the final decision. The speculation is that most of the projects funded will be in the Seattle to Portland end of the corridor. This is probably because the Canadian and BC governments have shown very little interest in helping to improve this service or invest anything in it. In fact the Canadian Customs and Border Services Agency (CBSA) has tried to kill the train with their outrageous demand for $1500/day for screening passengers. Transport Action BC will keep up the pressure on the governments to do the right thing and drop this stupid policy and start planning to see how they can improve this important rail service. Overall the Cascades services have been success with ridership growing steadily over the last 10 years and fare box recovery rising from 46% to 54% over the last few years. Of interest to BC readers, the second train to Vancouver has been doing well. 27,000 people have used the second train since it started last August. The trains did really well during the Olympics. Sixteen trains sold out during February. It is still up in the air as to whether the CBSA will officially waive its demand for $1500/day after the trial period of the train ends on March 31st. For now Amtrak is selling tickets for the summer season on the assumption that it will be continued.